Major house builder lacked understanding of loft fragile surfaces risk. A construction company has been fined after an employee fell through a plasterboard ceiling onto a staircase below at a site in Basingstoke in October 2016. Basingstoke Magistrates heard how the employee was working in a loft space when he fell through a plasterboard ceiling onto the staircase below. He sustained a punctured lung, six fractured ribs, a fractured vertebra and a fractured shoulder. HSE investigators found that there was poor planning of the pre-plaster work and a lack of understanding of the risks associated with working at height in the loft without adequate fragile surface protection. Croudace Homes Limited – of Caterham, Surrey pleaded guilty to breaching Regulation 4(1) of the Work at Height Regulation 2005 and was fined £80,000 and ordered to pay full costs of £5355. Speaking after the hearing, HSE Inspector Sharron Cripps said, “Falls from height remain the most common cause of work-related fatalities and serious injuries in the construction industry and the risks associated with working at height are well-known. 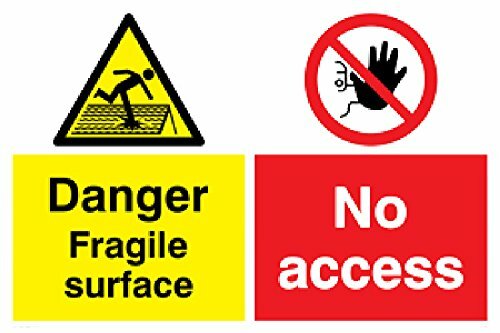 Working on or near fragile materials at height can be particularly dangerous and it is very important that those in control of the work identify the risk, plan to eliminate it if possible, or where it is not possible, take appropriate precautions to safeguard workers and others. Epica Health & Safety can help any company with their safe systems of work and method statements click the link to find out more.